VICTORIA— Sierra Club BC is asking the BC government to put Lemare Lake Logging Ltd operations on hold because the company is keeping its logging plans under wraps, while clearcutting endangered old-growth on Northern Vancouver Island. East Creek is located adjacent to the Mquqᵂin – Brooks Peninsula Provincial Park, in traditional Kwakwaka’wakw territory, and forms part of the largest remaining contiguous ancient rainforest on northern Vancouver Island. Sierra Club BC first requested Lemare’s site plans in early December, 2015. Since then, Lemare has evaded its legal obligation to provide the plans. Section 11 of the Forest and Range Practices Act requires logging companies to make their site plans publicly available “at any reasonable time” upon request at the company’s place of business. A recent Sierra Club mapping analysis showed East Creek on the northern island and the Walbran on the southern island among the most critical remaining intact areas and ecological steppingstones between the Great Bear Rainforest, Clayoquot Sound and Pacific Rim National Park. Sierra Club BC visited East Creek on a routine exploration of old growth valleys in the fall and discovered that the company is logging at an extremely rapid pace, literally blowing up old growth trees with blasting charges. Sierra Club BC documented evidently non-compliant logging practices, compromising salmon spawning habitat, water quality, marbled murrelet nesting trees and northern goshawk habitat. Much of the blame for the lack of stewardship belongs with the provincial government. Over the past 15 years, a combination of legislative and regulatory changes and cutbacks in compliance and enforcement and other staff in the Ministry of Forests, Range and Natural Resource Operations has made it next to impossible to know the state of our forests and easier for logging companies who chose to withhold information from the public. “Out of sight, out of mind seems to be government’s approach when it comes to logging of the last ancient giants on Vancouver Island,” said Jens Wieting, forest and climate campaigner with Sierra Club BC. 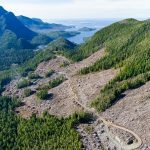 “This is another example why Vancouver Island needs a new conservation plan for healthy rainforest and healthy communities, respecting First Nations rights, based on science, and addressing climate change. A detailed chronology of efforts to view Lemare’s site plans is available on Sierra Club BC’s website.